Drop your kids off with confidence that they will be looked after in a safe, secure environment where they will have fun while learning. Scan the list below of available UNO camps and prices and search by type, age and grade level. Camps are generally in session from the date Omaha area schools dismiss for summer until they resume in the fall. Lengths, times, dates and application deadlines for each camp will vary. Register and pay online here. 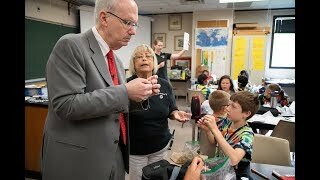 Connie O'Brien, director of the Aim for the Stars summer camp, speaks with Chancellor Jeffrey P. Gold about the summer science and math camp in this Maverick Minute.